Alcoholism can be detrimental not only to a person’s health, but to interpersonal relationships and the family dynamic. Although it’s common to drink to celebrate a holiday or major event, at family dinners, or when dining out with colleagues, some people drink alcohol regularly just to be able to go about their daily lives. Alcoholics don’t necessarily drink every day, but they physically crave alcohol and have trouble functioning without it. Drinking Statistics for SingaporeIt is believed that 4.3% of males and 0.8% of females regularly drink alcohol in Singapore. In this case regular drinking is defined as consuming alcohol on more than 4 days per week. One of the most dangerous patterns of drinking is binge drinking. This is where people consume an excessive amount of alcohol in a short time period with the intention of becoming inebriated. It is possible to be a binge drinker and not a regular drinker. The number of Singaporeans who binge drink is believed to be 9% of males and 1.2% of females. The World Health Organization report from 2004 also provided evidence for how alcohol abuse is often closely associated with road traffic accidents, rapes, and mental health problems in Singapore. * Those who abuse alcohol are more likely to engage in crime. * It can lead to depressive symptoms and suicide. * It may mean that the individual is unable to take care of their family – it is often children who suffer the most. * People who abuse alcohol tend to be less effective at work. This means that their employer will be getting less productivity which can be damaging to a company – there might also be senior employees who make bad choices because of their substance abuse. * A great deal of crime is associated with alcohol abuse. * This type of behavior is associated with domestic violence and sexually abuse. Although alcohol abuse does not necessarily indicate that a person is an alcoholic, if your father craves alcohol and needs it in order to follow his daily routine, he is an alcoholic. If you’re thinking, “my dad is an alcoholic,” talk to your father about it in a supportive way. Don’t nag or judge him; express your concern and kindly let him know that you want to help. Alcoholics often are in denial about their condition, so be prepared for him to tell you that he does not need help. You can’t force your dad to seek treatment, but you can make him aware of some resources that might help him and give him the opportunity to turn to you or another trusted friend, family member, or professional for help. If your father doesn’t react positively to your concern, you may wish to stage an intervention. Plan to sit down with your dad when he’s sober. Try to remain relaxed and nonjudgmental, and tell him that you feel that he needs help. If talking to your dad alone seems daunting, bring along a family member, or stage the intervention under the guidance of a counselor or therapist. Give specific examples of times your dad’s alcohol use negatively impacted him or the family and be prepared with information that explains where he can go to seek treatment. Offering Positive SupportYou can also find support for yourself or other family members through counseling, therapy, and by meeting with other children of alcoholic parents. 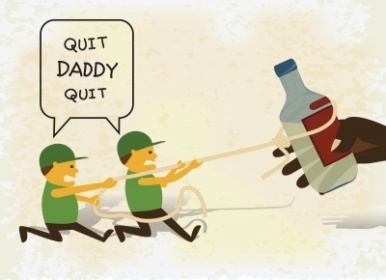 When dealing with an alcoholic father, don’t assume that support means helping him cover up the effects of his drinking or making excuses when his alcoholism causes a problem. If he does not have to deal with the consequences of his behavior, he may not be motivated to seek treatment. If your father is an alcoholic, he can seek treatment in the form of support groups, rehabilitation centers, and counseling. Do some research before you confront your father to make it easy for him to reach out and seek treatment immediately. You can also find support for yourself or other family members through counseling, therapy, and by meeting with other children of alcoholic parents. Alcoholism affects the entire family, and supporting your father involves helping yourself and finding ways to cope with his addiction. * The National Addiction Management Services offers advice on all types of addiction problems. This service is located in Buangkok View and can be contacted on 6389 2387. * Alcoholics Anonymous is a fellowship of men and women who support each other in an attempt to quit alcohol. There are meetings in a number of places in Singapore and they can be contacted on 6475 0890. * There are many Singaporeans who decided to travel further afield in search of help for their addiction. The Drug and Alcohol Rehab Asia is the leading destination for those looking for quality treatment in Asia. * We Care Centreoffers support for anyone affected by addiction in Singapore. They can be contacted on 6471 5346.